Rolando Blackman knows personally the value of education. When he came to the U.S. at the age of eight from his native Panama, he spoke little of the language, and for three years he went to school two to three hours before the first bell sounded to meet with teachers who were committed to helping him learn to read and to catch up to his peers. “I am an immigrant, and I understand what it takes to be fruitful and successful in this country,” he says. A strong education set him up to be very successful indeed. You likely know of his success on the court. In his 13-year NBA career (eleven with the Dallas Mavericks), he scored 17,623 points and had over 3000 rebounds. He has been named an All-American, a U.S. Olympian, and an NBA All-Star. Rolando is one of only two players in Dallas Mavericks history to have his jersey number retired. The time he spent in Brooklyn at the famed Ditmas Park – now renamed Rolando Blackman Park – and his own athletic prowess prepared him well to play basketball. It’s his own professionalism, character and dedication to service that have made him an even bigger presence off the court. 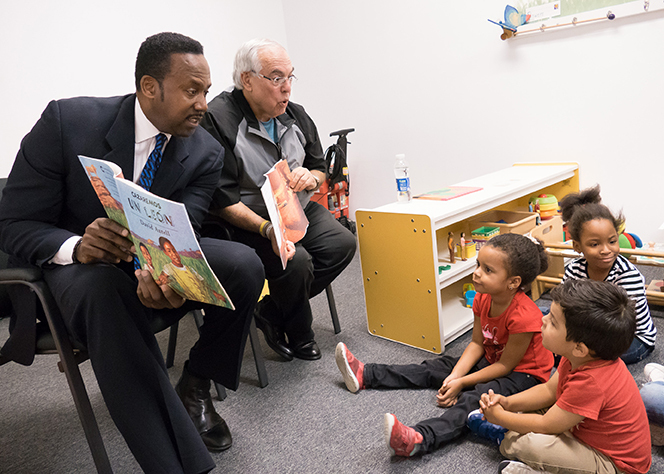 The day we met Rolando he was preparing to read a book – in his native Spanish – to a group of preschoolers in an urban child development center. “I enjoy the wonderment of learning on their faces and introducing them to new words and ideas… it gets their minds going.” It is one way he is giving back to the Dallas community he now calls home through an organization called Educational First Steps (EFS). EFS partners with preschools to ensure the children are getting more than babysitting, to ensure that teachers are prepared to take advantage of this critical time in a child’s life to give them a good foundation for learning. “Early education gives children the opportunity to establish that ‘pier and beam’ base, to set the foundation of understanding,” Rolando says. Having seen the benefits of good teachers in his own life, he believes educators are among some of our greatest resources. “For me, it’s just as important as being a heart surgeon,” he states. “It’s a huge responsibility.” Rolando stresses the importance of having qualified teachers committed to helping students see their future and the steps they need to take to get there. He also believes teachers can help set children up for future success by instilling social values and the importance of how they present themselves. “They are establishing guiding principles for the future person that child will grow up to be,” he says. Rolando likely didn’t see as a young child that in his own future he would make such a huge impact across the world. He has traveled all over Africa as a Goodwill Global Ambassador to the Office of Drugs and Crime for the United Nations, where his focus is on human trafficking and child soldiering. He has helped to establish a school in Senegal. He has served as an ambassador for the NBA Generations for Peace and the NBA Cares Program. As Vice President of the National Basketball Players’ Association, he served as the voice for Team Up to encourage youth volunteerism. Special Olympics and Big Brothers/Big Sisters have benefited from his support as well. And the list goes on. “I believe it’s always important to help with the process you want to see,” Rolando explains. Of course, he loves staying close to home in Dallas and serving as part of the Mavericks organization. In his current position with the team, he helps with corporate relations and foundation work, interacts with season ticket-holders, oversees in-game services, and, naturally, engages in community relations. He appreciates spending time with his four grown children, Valerie, Brittany, Briana, and Vernell and his two young children, six-year-old Gabriel and three-year-old Mirei. “Dallas is a fantastic place for me and my family… I love the camaraderie with the people of this city,” he says. And we are lucky to have this all-star legendary player and generous philanthropist in our midst. For his dedication to promoting education, character building and his commitment to his community, we present Rolando Blackman with our Very Inspiring Parent award. Educational First Steps (EFS) is “growing the future” for at-risk children by planting the seeds of high-quality early childhood education. EFS partners with 93 daycare centers in at-risk neighborhoods, carrying out a results-driven program for becoming nationally accredited preschools, at no cost to the centers, teachers or parents. These centers progress from daycares providing little more than babysitting to nationally accredited early education centers that become anchors in their neighborhoods while preparing more children for school and life success. About 6,000 at-risk children ages birth to 5 years old are receiving quality early education because of EFS’ investment. Their One Childhood One Chance luncheon on November 13 will feature Rolando along with moderator Brad Sham, the Voice of the Dallas Cowboys. For more information visit www.educationalfirststeps.org. Our Very Inspiring Parent (VIP) Award honors the everyday, and not-so-everyday, heroes in our midst. Those whose tenacity, integrity and courage inspire others to exemplify the same character and put their families and community first, in spite of the challenges life has thrown at them. For complete details or to nominate visit goodLIFEfamilymag.com or email Tricia@goodlifefamilymag.com. Events and Activities Yule Enjoy this Holiday Season!